Nov 11, 1997 we took a little almost 3 yr old to the circus. There she fell in love with an elephant named Pete. By her 4th birthday Little Sammi Walker was dreaming of being a missionary elephant trainer to Africa. 4 1/2 years later she boarded a plane for her first missions trip to Mexico City. This spurred by the thoughts of her parents to help her reach this dream! "Let's see what this missions thing is all about!" we thought! Little did anyone realize that this trip would re-awaken a dream inside of someone else's heart to actually make a difference in the world. The dreams of a little 4 year old would help to re-awaken the dreams long asleep deep inside the hearts of her parents! You know the dream!! The one where you are a hero! Where you make a difference in the world! Those dreams are placed in our hearts as part of our destinies! We all have them when we are born! We are invincible and we can and will change things around us! We will be the one to make a difference! Then somewhere along the way we get caught up in the day to day life and we stop dreaming in a sense. We stop envisioning our lives making much of a difference and those dreams go dormant. We listen to the lies of the world and sometimes people around us that say, "you can't make a difference"! But that's just it...we have to stop listening to these lies and realize that each and everyday we can make a difference in someone's life! On Wed, I went to the pool store..nothing big! Bought chemicals to put in the YWAM pool in orlando...but there on the corner stood a panhandler. The lady looked beat! Hot, skinny, sunburned, scrawny and yeah a little hungry. I was suddenly overcome with compassion for this lady, I have no money I thought. But you have bottles of water a little voice in the back of my mind said! Guess what I listened. I watched a car a couple cars in front of me give her a couple of bucks, she thanked him and dejectedly put the money in her pocket. When I pulled passed her I handed her the water with a quick apology of having to money. But there is was...the look of hope! The look in her eyes as she spied that bottle of water that looked as if I'd just given her a million dollars! What was the difference! Holy Spirit knew what she needed and I listened. Bringing hope and helping people and ourselves keep dreaming through God's prompting is what missions is all about. That's what our family is working to do! Serving God as He sees fit! That looks different each day because each day is different, each of us is different and what each of us has is different. Rsch of out dreams is different. God can and will use all of us if and when we are obedient. I didn't do anything that any of us couldn't do. Latest news from the Walker Family! 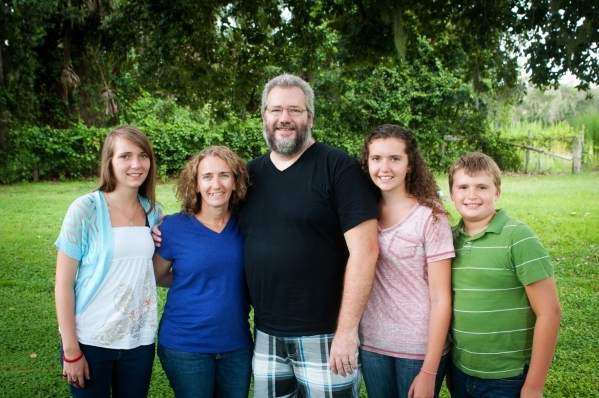 You can go to http://www.ywamorlando.org/staff/56-ywam-orlando-staff/53-nwalker to donate to the Walker Family. Santiago, Dominican Republic here comes the Walker Family! Ned and Debbie and family will be joining YWAM Santiago Staff while partnering with YWAM Orlando to set up a Family Center in the Dominican Republic. We have currently been working on staff with YWAM Orlando for 4 years. We will still be on YWAM Orlando staff, which means that YWAM Orlando will still process our support, while working with YWAM Santiago in Santiago Dominican Republic. At the end of August, we will be moving to Santiago. Our first tasks will be acclimating to the culture, learning the language and building relationships with the local churches and ministries in Santiago. We were able to work alongside a group of churches while we were there to help grow and strengthen the local church. The local church is growing and working to train up young pastors but still needs help as for years the church has been a mix of Catholism, voodoo and religious structure and have not known a true relationship with Jesus. We will also be working with YWAM Santiago to help with their SUYO program which trains local dominican youth to reach into their own communities with evangelism and helps. We are all super excited and working towards this big move! EQ trip 2013: Sammi, Hannah and Jesse just got done doing a 2 week local outreach trip called Epic Quest here in Orlando with YWAM Orlando. They did quite a few different ministries ranging from sorting soaps and clothes to feeding some local homeless. They worked with a couple of different children's ministries doing children's church and day camps. One of Sammi's favorites were the survey's in downtown Orlando. Each small group had a short survey with 4 questions normally that led them to a discussion about Christ. Hannah really learned that she needed to just be bold and put herself out there while doing these survey's. Talking to strangers is not something that she naturally likes to do but one thing that God has asked her to do and she enjoyed it when she stepped boldly and just did it! Jesse loved working with Orlando Rescue Mission and doing the day camp there. He really enjoyed playing with the kids and realized that so many of these kids have nothing and live in a "rescue mission" and have no home. Something that made him appreciate all that he has. The kids are all looking forward to moving to the DR with the family. Sammi graduated homeschool this year but is looking forward to spending a year with the family in the DR and helping us transistion. School options are still open for Hannah and Jesse. We are still trying to decide if we will continue to homeschool or if they will go into a local school in Santiago, in order to help with language learning and the transistion. We would appreciate your prayers in this area. Ned and I had a blast leading the All-Generations DTS (Discipleschip Training School)! This school was able to serve over 10,800 people in the two months that we were on Outreach to Vero Beach and the Dominican Republic. We worked with Life for Youth Camp and The Source in Vero Beach and with many churches in the Dominican Republic. We worked with Chapel Project in Cien Feugo, Santiago, DR where we were able to do evangelism in the streets and public schools and build the church while also finish putting the roof on the building that we call a church. We really learned first hand how the people in the building are really the church. It is not about a building but about a relationship with Jesus that permeats out of us into the lives of those around us. That is what being the church is really about. Our team saw over 850 salvations and were able to connect these new believers with a local pastor and mentor to help them grow in their new relationship with Christ. This group of 20 ranging in ages from 12 to 68 quickly formed a neat family unit where we all lived and served together! We laughed alot and shared some amazing moments! Copyright © 2013 Ned and Debbie Walker, All rights reserved. Thank you for being a part of the Walker Family Ministry. We had a great trip with the All-Generations DTS to Santiago, Dominican Republic. We saw over 800 salvations and ministered to over 10,000 people. One of the neatest things to me was the involvement of the local church. The local church is growing and our presence as missionaries helping to gain attention and draw people to the church was incredible. We are excited to be moving to this same area in August. We were able to make a lot of contacts there are look forward to working alongside the local Dominicans as they work to change their nation with God's help and ours. Please consider being a part of our mission and move. We are in need financially and prayerfully at this time to make this move a success. 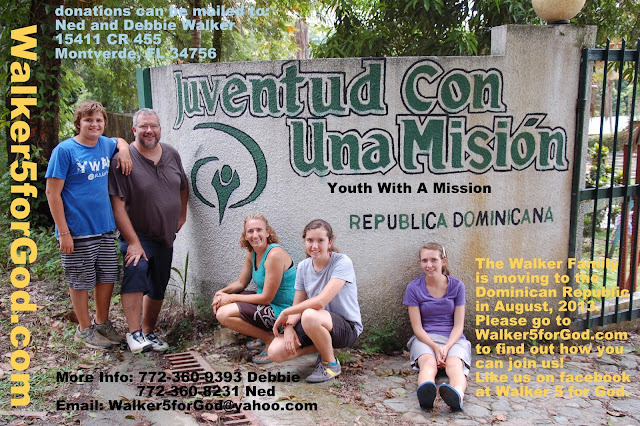 Contact us at Walker5forGod@yahoo.com to find out how you can be a part.